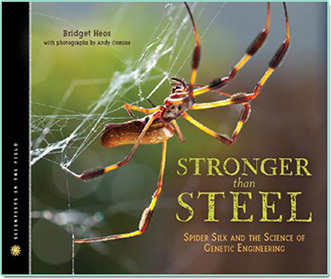 Stronger Than Steel: Spider Silk DNA and the Quest for Better Bulletproof Vests, Sutures, and Parachute Rope, a Houghton Mifflin Scientists in the Field Book was selected as a School Library Guild Book, resulting in a sale of 4,300 books before its release date of February 2013. Teachers, there is an excellent classroom activity guide available: click here! "Clear focus, careful explanations with occasional repetition of denser information, and a wealth of color photographs make this title inviting and accessible. . . and the kissin'-cute goats should entice quite a few readers to explore this project further."